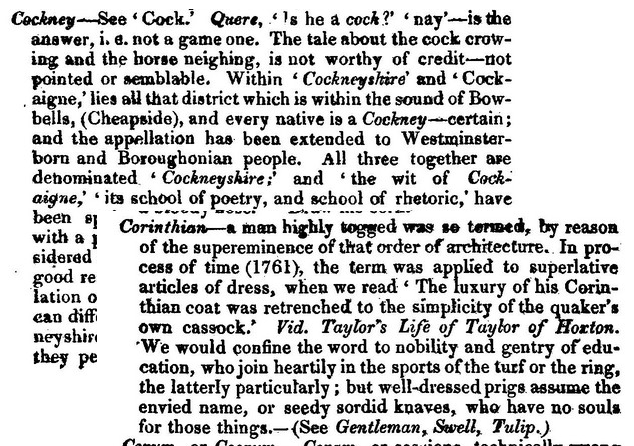 Thanks to a post in the wonderful Jane Austen’s London blog (see reference at the bottom of this page), yes, we now have a copy of Slang: A Dictionary of the Turf, the Ring, the Chase, the Pit, Or Bon-ton, and the Varieties of Life (1823) by ‘Jon Bee’, pseudonym of sport writer and journalist John Badcock; and having arbitrarily opened the dictionary at ‘C’ I am now fascinated and excited by the very rich cultural content that goes well beyond what one might expect of a simple lexicon. Chaunt–a song and singing. The best conducted chaunt in London is at the White Hart, Bishopsgate-street; a good one is ‘the Eccentrics’ in May’s-buildings; glee-singing by the Harmonics at the Ram, and also at the Globe, in Titchfield-street are prime chants.